I wanted to share a little about our Twist Swivel Stools we have pushed up to the island. They are from World Market and are on sale right now. We originally bought three of these stools when we first moved in. We have a large island, but the lip isn't huge. After living in the space for almost 3 years, we realized we needed a fourth stool, well, because there are four of us, and someone was always standing to eat a quick snack or even eating dinner if we were doing something casual. We also found that it was annoying to not all be able to sit around the island if we had friends over. We have 14 other chairs in the house between the dining and kitchen tables, but for some reason, the island is always the gathering place! This past weekend, I purchased another stool and got it for $89! These are originally $119, but all furniture is 25% off right now. I have been extremely happy with these stools. It gets great reviews online and they have been selling it for several years, which is a good sign! The main things I like about the stools are that they twist up and down and can adjust to the height of the person sitting in it. Steve is 6'3", I'm 5'6, and we have two little people that are growing like weeds. These stools adjust with us, and I love that. 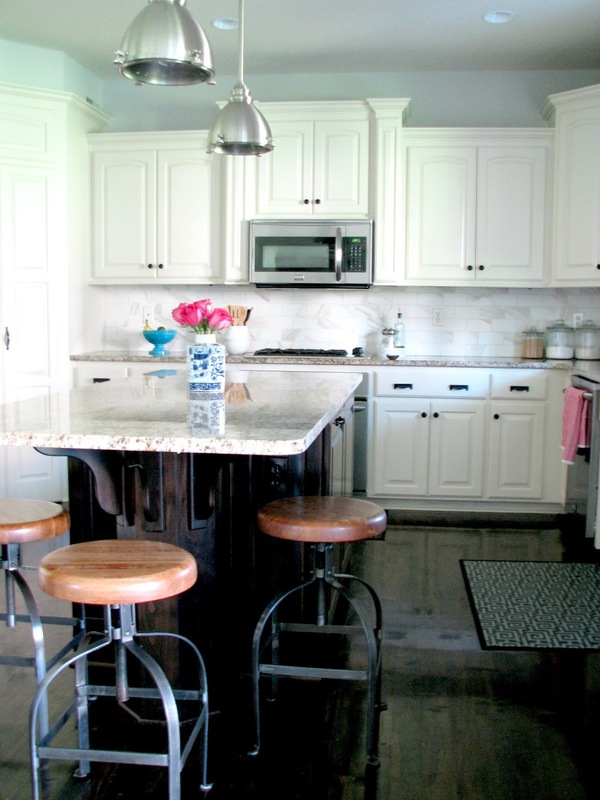 I also love that they are backless and can be pushed under the lip of the island. Four of these stools will still fit underneath the lip, allowing walking room around the perimeter of the island. That is a huge plus in my book. 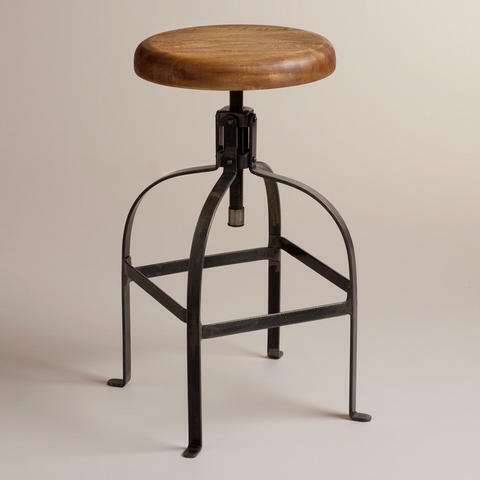 I also love the industrial feel of these stools. We do keep felt furniture pads on the bottom of the feet so they don't scratch our hardwood floors. Breakfast and lunch get eaten at the island, and sometimes dinner, so these get a lot of wear and tear. They have held up great and would highly recommend! Now is the time to purchase them if you are in the market for some stools! Here is another great, affordable option…my dad is retiring next month, and my parents are moving and building a town home. My mom was on the hunt for some counter height barstools and found these Linen Barrel Stools, also from World Market. 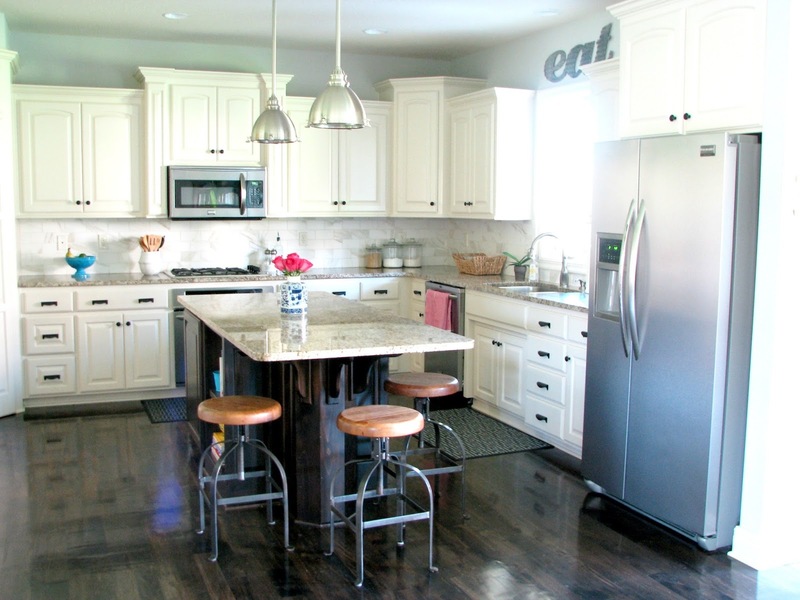 She is doing a dark kitchen, and wanted something light pushed up to the island. These couldn't be a better deal! 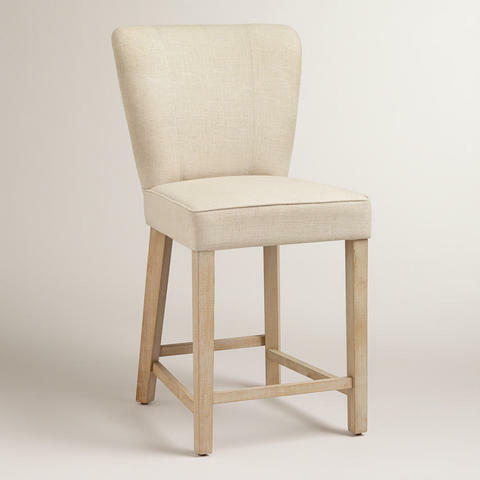 Each stool is on sale for $80, and when you take an additional 25% off, these are a steal. They are fabric, but she doesn't have kids! :) I love the light wood legs! 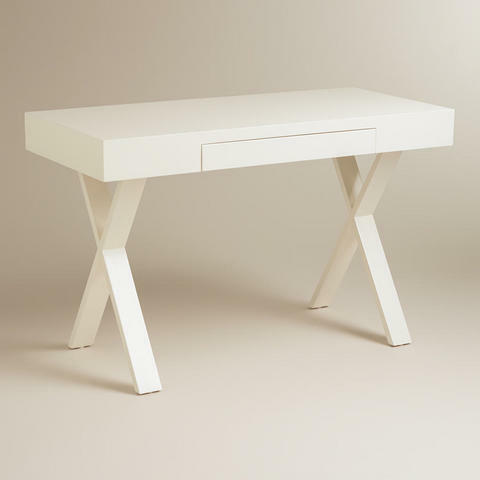 While I'm on the subject, I'm thinking I need this white lacquered desk too! I would use it as a bedside table in the master…the possibilities are endless for this piece at just $150.